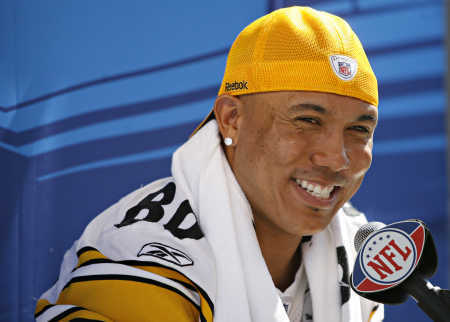 *TMZ is reporting that Pittsburgh Steelers superstar and “Dancing With the Stars” contestant Hines Ward was removed from a vehicle at gunpoint by LAPD officers and placed in handcuffs this morning in Los Angeles. But he was not arrested, according to the website. Ward was reportedly a passenger in a Honda Civic around 2 a.m. when it was pulled over by LAPD. According to law enforcement sources, cops had run the license plate and noticed the car had been reported stolen. According to TMZ, police drew their weapons, ordered both Hines and the female driver out of the car and placed them both in handcuffs. The female driver then explained that she was the person who reported the car stolen in the first place after an incident involving a valet. But she got her car back and forgot to tell cops to call off the alert. The officers verified her story and eventually let both Hines and the driver leave without further incident. According to TMZ, law enforcement sources say Hines was very cooperative and understanding about the situation. thank goodness….never heard of him till DWTS, he is delicious. Well, at least they didn’t have them spread-eagled on the pavement while they took an eternity to run their IDs. Y’all remember that family that was on a vacation trip and the cops had them lined out up and down the pavement because of some similar misunderstanding? Hate to say it but hope this serves as a wake up call for Hines. He really wants no parts of his black half but whitey just reminded him that’s all they see in him.